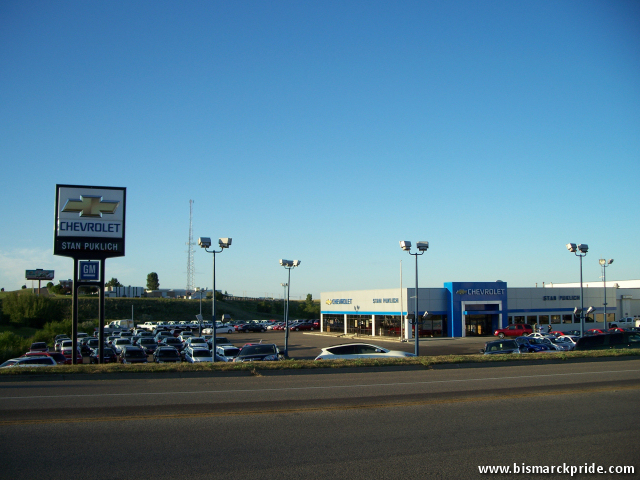 Puklich Chevrolet is a long-time Bismarck auto dealership located at 3701 State Street. Since 2015, it has also operated Puklich Chevrolet Buick GMC in Valley City, acquiring the former dealership operated by the Perkins family. The dealership originated as Capital Chevrolet in 1925 and became Davis Chevrolet in 1943. Tierney acquired controlling interest in the dealership from the Davis family in 1976 and renamed it, and full ownership in 1978. Its sales in 1978 exceeded $11.5 million. In 1979, it moved to a new dealership off Highway 83 and Calgary Avenue, from downtown. The cost of construction for its new dealership was $1.5 million. The building originally spanned 52,000 square feet with a lot size of 800 vehicles, plus 250 parking spots for guests and employees. Resembling the Northern Pacific railway depot, its design was that of a Spanish earth-colored tile roof and off-white stucco walls. At the time, the new dealership was quite isolated. Little north of Century Avenue had been developed. It was not until the the 2010s that development swallowed the site. The dealership suffered scrutiny in 1982 after running a “going-out-for-business” sale, in which it advertised the need to “liquidate immediately its entire new and used inventory.” The state attorney general argued that the deceptively clever marketing gimmick violated consumer fraud laws. Leo Tierny denied any deceptive practice, but agreed to sign an assurance of discontinuance. In 1983, partners Joe Perry, owner of Perry-Eastgate Funeral Services, and Stan Puklich, a general manager of a Jamestown car dealership, acquired Leo Tierney’s ownership stake. At the time, the dealer carried the Chevrolet, AMC-Renault, and Bavarian Motor Works (BMW) lines. Today, the dealership is operated by Stan’s daughter, Elyse.